Members of Bit Loom Douglas Flinders, Henry Pullan and James Wood demonstrate last year’s winning game PHOGS! Abertay University’s Dare Academy computer games design contest is back for 2018 following major commercial and critical success for last year’s participants. 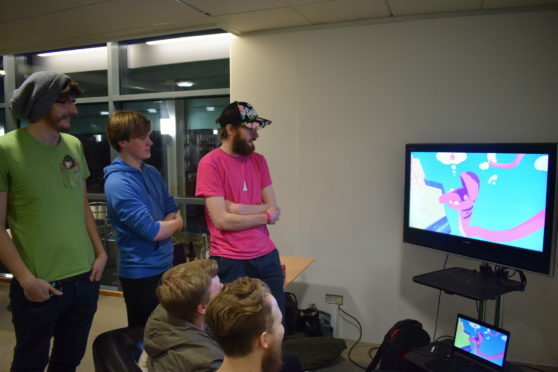 This year’s competition will see mixed teams of Abertay student programmers, artists and designers do battle, creating a wide range of high quality games for mobile, PC and console devices. A panel of expert judges will select the top six teams to progress to the “hot-housing” development stage this summer, which will see the students refine their prototypes under the guidance of respected industry mentors. All six of those teams will scoop a paid trip to showcase their work at the massive EGX games festival in Birmingham, while members of the winning team will jet out to the world’s biggest games conference, GDC in San Francisco. James Wood of last year’s winning Dare Academy team, Bit Loom, was on hand to welcome applicants to the launch at Abertay’s Hannah Maclure Centre, revealing how life had changed since landing the top prize. The team’s unique game PHOGS! – a puzzle game involving a double headed dog – is set for release across all major platforms next year and gained high profile media coverage on the back of fully paid trips to EGX and Indiecade in Los Angeles last year. James said: “Dare was a great experience for us as a team. The hot-housing period gave us the perfect opportunity to build and play-test a short but polished prototype demo with some amazing feedback and advice from industry professionals. “Showcasing the game at events was an incredibly fun experience and invaluable for seeing a huge variety of people’s response to the game itself. Head of the Division of Games and Arts Dr Dayna Galloway said: “Abertay is the number one university in Europe for computer games education and this competition showcases the incredibly high standard of games that our students are capable of producing. Bit Loom is not the only team to have enjoyed success since Dare 2017. Last year’s finalists Wee Door are currently promoting their game, Oil, which came second at the Very Big Indie Pitch at Pocket Gamer Connects London 2018. Fellow finalists Pocket Sized Hands have had a great reception for their virtual reality game, Honeypot Espionage, and its success through Dare Academy helped them grow into a small start-up company, which does VR games alongside their own intellectual property. The team also travelled to Seattle last year as one of the World Finalists to be selected for the prestigious Microsoft Imagine Cup. Another Dare team, Lavalamp Games, produced a narrative-driven exploration game focusing on mental health and social change, a demo version of which is now available for download.